Now. Now is the time to plan to make all those asparagus dishes you have been savoring since asparagus finally disappeared last summer. You’ve seen ideas since then, craved them, clipped them, saved them in a drawer or on your computer. Or, you can use something new. I recently posted a review of a fabulous meat cookbook, Lidgate’s, from Great Britain. It’s a great book, one of the best meat cookbooks you will ever see, and one worthy of you taking a look. And, if you do look, you will surely want to buy and try many of the recipes that are brilliantly written and photographed here. British food is famous for using meat, whether it is mammal, poultry or fish. And the British love their pies. Having “crust” seems almost mandatory for at least one of your dinner dishes. 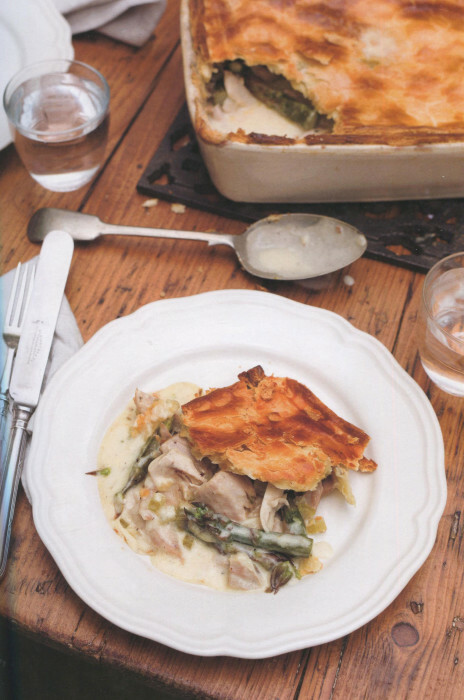 This pie, abundant with chicken and carefully prepared asparagus, is the perfect springtime meal. It’s hearty enough for a cool spring night and rich enough to make any brunch or Sunday family meal a fulfilling success. There are multiple steps in this recipe: making a stock with woody asparagus bottoms, cooking the chicken in that stock, sauteing veggies and then the asparagus tips, pouring all the ingredients into a pie dish, and topping with the crust. It’s a dish for when you want to Sunday afternoon in the kitchen, music playing and the wine bottle slowly emptying. And, some white wine is optional here anyway, so why not enjoy a glass along the way. First make the pastry. Combine the flour and salt in a bowl. Add the butter and rub into the flour using your fingertips, until the mixture resembles breadcrumbs. Add half the egg wash and mix roughly with a table knife. Use your hands to form it into a dough, then knead briefly. Shape it into a ball, wrap in cling film or greaseproof paper and chill for at least 30 minutes. Meanwhile, make the stock. Pour the oil into a saucepan, add the celery, onion, carrot, bay leaf and woody asparagus bits and sweat over a medium-low heat for 10 minutes, stirring occasionally. Add the wine (if using), bring to the boil and bubble for a minute to burn off the alcohol. Add the drumsticks and water to the pan, return to the boil, then cover and simmer for 45 minutes. Preheat the oven to 4O0°F. Strain the stock and measure out 400ml (14.fl ounces). Save any left over for use in another dish. Discard the vegetables and bay leaf. Allow the chicken to cool slightly, then take the meat off the bones, discarding the skin. Cut into large chunks. Melt the butter in a sauté pan on a medium-low heat, add the shallot and celery, season well and cook until soft (about 10 minutes), stirring occasionally. Sprinkle in the flour, add the measured stock and creme fraiche, stir to combine and bring to the boil. Allow to bubble away to thicken slightly. Add the chicken chunks and asparagus tips and simmer for 3 minutes. Add a squeeze of lemon juice, then taste and adjust the seasoning if necessary. Tip the chicken mixture into a pie dish, about 25 x 20 x 7cm (10 x 8 x 3in). Put a pie funnel or an upturned eggcup in the center. Dust a work surface with flour and roll out the pastry so it is about 5cm (2in) larger all round than the pie dish. Cut 1-inch strips from each edge of the pastry. Press these on to the lip of the pie dish, trim off any excess and brush with the remaining egg wash. Press the pastry lid firmly on top of the pastry rim, then crimp the edges together to seal. Reroll the pastry trimmings and cut out shapes to decorate the pie, sticking them on with the egg wash.
Bake for 30-40 minutes, until golden and the pastry is cooked through.